As you have probably noticed, we made several improvements to the site in February and March to help make your sniping life easier! The user login area has moved. It is now https://bidslammer.com/user/. Formerly, it was http://home.bidslammer.com/. You will need to update your bookmarks, if you have any; otherwise the regular login process will take you to the right place. Improved Slam-it Toolbar. If you use Slam-It, please delete the old toolbar and add the new one that appears on your snipe home page in the messages area. 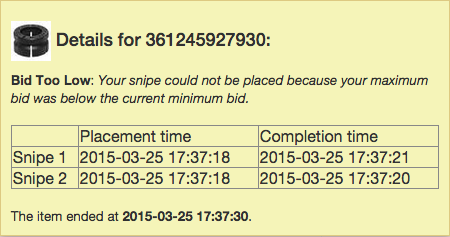 Snipe times are now shown for all snipes. since we place 2 or more snipes, we thought it would be nice to display results of each snipe attempt for each item, so that you rest easier knowing we placed your snipes. Win and Lose status for auctions has been significantly improved. Sniping is the easy part. The real challenge of this service, we think, is determining any of the 30+ reasons you can miss a snipe and reporting it to you in your Snipe Home page. This should also fix a long-overdue bug of reporting some snipes as wins. The built-in search engine has been moved up top to a more prominent position. In theory, you never have to leave eBay to do all of your searching and adding. New unlimited pricing plans! Yep, finally, we have decided to offer unlimited plans. This is great news for those of our customers that were preiously paying $200 or more per year — in some cases, more than $500 — to use our service. The navigation bar has been moved to the left side. The import Watch List feature has been moved from the top navbar to the “Watched Items” area on the left navbar. Form validation has been added to all forms to improve the user experience. The mail-password feature (used when you can’t remember your password) will now force you to reset your password as a safety measure. Good luck sniping! We hope you enjoy the new features.